These were fun to make and I’m keeping my fingers crossed. I also made two in pink for my sampler for this year. I hope I’m in time for the sneak peak! Lovely! 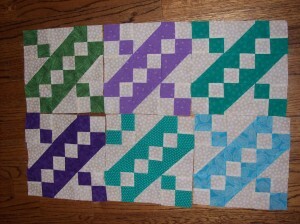 Pssst….I see the turquoise one had a block turned the wrong way.